Llama pack trips are a fun and “light” option to your traditional backcountry experience. These animals are native to high mountain terrain and thrive while climbing. You can allow a llama to carry all of your equipment while you relax and enjoy the views of your guided tours of Rocky Mountain National Park. Llamas can carry up to 80 pound of equipment. A llama can also carry small children. Imagine how much fun your child will have while riding on the back of our gentle giants! Your guide will set up camp, prepare meals, and provide fishing guidance if needed. 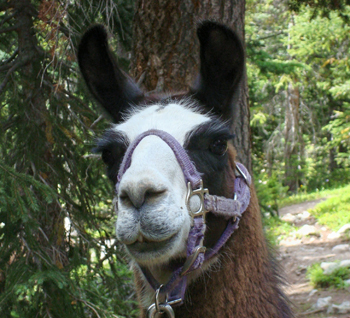 We can also utilize our llamas on our one-day Rocky Mountain National Park trips, the choice is yours! Kirk’s Mountain Adventures will provide all necessary equipment, including tents, sleeping bags, backpacks and food, and will prepare your itinerary and reserve your backcountry sites. Lunch Included. Kids under 80 lbs may ride llama.